"Bill, I live in the sandhills of North Carolina. Should I start pruning my Roses now? Also how much should I take off? We have had an exceptionally mild winter. What do you suggest about the hydrangea? I did not prune ours in February as I normally would because of the odd weather. It is starting to bud out. Thanks! ESO"
5-10-5 fertilizer or commercial rose food. The methods and timing of Rose pruning is pretty much determined by the type of rose that you are dealing with, so I will try to cover them all. Sucker growth (stems which originate from below the budding union) should always be removed at their point of origin no matter which type of rose. Pruning cuts should always be made ¼ to ½ inch above an outward facing bud. Make your cuts at a 45 degree angle to prevent moisture from collecting on the cut, which can cause rot or disease. Always use a clean, sharp pair of shears. 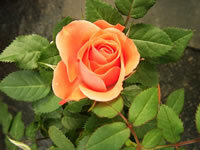 Prune Hybrid Tea Roses in early spring when the new growth just begins to show. Start by removing old, winter damaged or diseased wood, cutting it back to a healthy point. You will want to create a somewhat cup shaped plant by removing center stems, and inward pointing branches. This will admit more light and fresh air, and help to prevent mildew and disease. Cut the remaining stems to about 1/2 of their original length, leaving the stronger stems longer than the younger, thin ones. Hard pruning will result in fewer long stemmed blooms than light pruning, but if it necessary you can cut some of the older stems back to within 6 inches of the base. Prune Floribundas and Grandifloras in early spring. than the outer ones to form the desired shaped plant. Pruning the canes at different lengths will help to insure continuous blooming. Ramblers grow a completely new set of blooming canes each year. The flowers are formed on year old canes, which should be cut back to within 2-3 inches of their base when they are finished blooming. This will allow the plant to devote its energy into producing the new shoots that will bear the next years flowers. Climbing Roses resent hard pruning. In early spring, remove any dead or diseased canes. Other than that you should only do light pruning for shape. Climbers should be pruned and trained to grow in a more fan shaped pattern rather than for upward growth. If it becomes necessary, the canes can be shortened at any time of the year. Miniature Roses need very little pruning. Just prune them to the desired shape. Cut any new shoots which have emerged from below the soil line to about 1/2 their length. When the branches finish flowering, cut them back to a new outward facing bud. French Hydrangeas, Hydrangea macrophylla, blooms from the previous years buds, and should be pruned in the summer when the blooms have faded. Most hydrangeas bloom on new wood so if you decide to cut your plant back now, I would think that it will send new buds again, but I can't promise you that. Since it isn't necessary to prune hydrangeas every year, I think that if it were my plant, I would snip any dead branches, and possibly do a little shaping, but otherwise let the plant go ahead on its own schedule.